An impending update - Cola 3: The Soda of Style by Corwin B. View all by Corwin B.Corwin B. 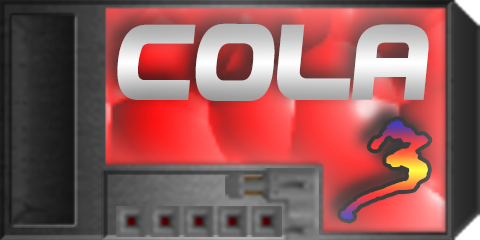 Thanks to some recent updates in GZDoom that added extra troublesome startup error spam encouraged me to tidy up my coding habits a bit, as well as some feedback from ICARUSLIVES and a few things I'd declared "missed opportunities," Cola 3 is nearing time for an update. So please let me know if there is any outstanding problem with the mod - I may be tweaking some numbers here and there for purposes of balance, in particular I'm hearing about the shotgun being a bit underpowered, among other things. I'm also aware that there is a rare game-crash bug that occurs when the player has been killed, but not all the time. I'm having difficulty reproducing it, let alone tracking down any potential cause, so if there's someone out there that can figure this out for me, I will be extremely appreciative of the help. Once all that's ironed out, I'll be pushing a v1.1 update, and putting the mod on the /idgames archive to be preserved for the foreseeable future. "I'm having difficulty reproducing it, let alone tracking down any potential cause, so if there's someone out there that can figure this out for me, I will be extremely appreciative of the help." If i may ask which SVN you use to play this? This may ensure stability since several SVN have different effects and issues depending on the mod/plugin/script. Some has none, some game breaking or crashing. Most of my testing was on GZDoom 3.2.5, and while I have not managed to reproduce the crash with any reliability, I can say enough to know it's persisted on versions as new as 3.3.0. I know it still exists - I just don't know where. The only commonality between any of the crashes I've had reported to me is that it occurred as the player died, but player death in itself is not enough to crash it.